Based on the integral representations of the solution derived via Fokas’ transform method, the high-frequency asymptotics for the solution of the modified Helmholtz equation, in a half-plane and subject to the Dirichlet condition, is discussed. For the case of piecewise constant boundary data, full asymptotic expansions of the solution are obtained by using Watson’s lemma and the method of steepest descents for definite integrals. There is huge mathematical and engineering interest in acoustic and electromagnetic wave scattering problems, driven by many applications such as modeling radar, sonar, acoustic noise barriers, atmospheric particle scattering, ultrasound, and VLSI . Many problems of scattering of time-harmonic acoustic or electromagnetic waves can be formulated as the Helmholtz and modified Helmholtz equations, supplemented with appropriate boundary conditions. Many efforts have been made to develop efficient numerical schemes and approximate methods to deal with the problems of high wavenumbers (i.e., high frequencies) [2–6]. It is noted in [4, 7] that a question yet to be fully resolved is to obtain accurate approximations of the solutions with a reasonable computational cost in the high-frequency case. Therefore it seems desirable, and difficult, to consider the high-frequency asymptotics of the equation and its modified version. This is the main motive of the present investigation. Applying the theory of asymptotic analysis [8–10], one may achieve a high degree of accuracy with only a few leading terms in the asymptotic expansions of the solution involved. where n is the outer normal vector, △ = ∂ 2 ∂ x 2 + ∂ 2 ∂ y 2 = 4 ∂ 2 ∂ z ∂ z ¯ is the usual Laplace operator, z = x + i y and z ¯ = x − i y , Γ = ∂ Ω is the closed real line, d decays sufficiently fast at infinity (e.g. d ∈ L 1 ( R + ) ∩ L 2 ( R + ) ). As a first step, we given the integral representation for the solution of the Dirichlet boundary value problem (1.1)-(1.2) for general d ( z ) derived by Fokas’ transform method. where [ a , b ] refers to a finite interval and D is an arbitrary constant. For the Dirichlet boundary value problem (1.1)-(1.2), by using Fokas’ transform method, we have the following lemma. D ( k ) = ∫ − ∞ ∞ e − i β ( k − 1 / k ) s d ( s ) d s .
The interested reader is referred to [, Ch. 11] and  for derived in detail. Accordingly, when we specify (1.2) in accordance to the piecewise constant Dirichlet data (1.3), we have the following lemma. where l is an arbitrary ray in the first quadrant of the complex k-plane, oriented from the origin to infinity, with an angle between l and the positive real axis less than π − arg ( z − b ) . Our goal in this section is to study the asymptotical behavior of the solution to the Dirichlet problem of the modified Helmholtz equation, as the frequency, or, equivalently, the wavenumber, approaches infinity. This large-β asymptotic analysis will be based on the integral representation (2.3), and it will be carried out by using the method of steepest descents. φ ( k ) = i [ k ( z + A ) − 1 k ( z + A ) ¯ ] , k = u + i v , z = x + i y , z + A = r e i θ . The phase function φ ( k ) has a pair of saddle points k ± = ± i e − i θ = ± e i ( π / 2 − θ ) determined by φ ′ ( k ) = 0 , lying symmetrically on the unit circle. 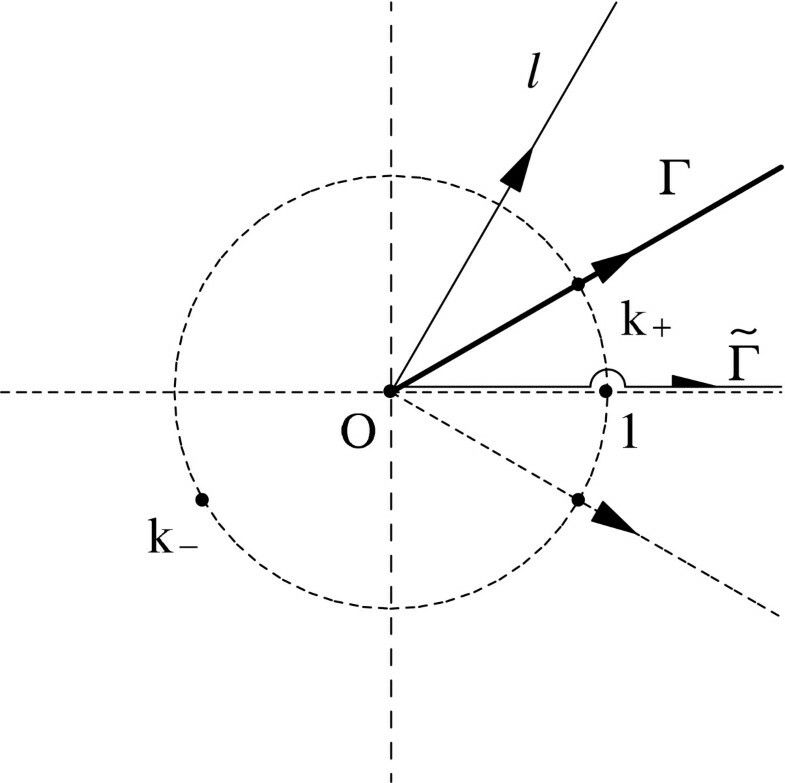 For large positive β, the steepest descent path passing through the saddle point k + is simply the ray Γ starting from the origin and passing through k + . We note that the steepest descent path is defined by requiring Im φ ( k ) = Im φ ( k + ) and Re φ ( k ) to decrease as k goes away from the saddle; cf. [8–10] for the definition and for basic background of the method of steepest descents. Also the steepest ascent path through k + is the unit circle, and it ends at the other saddle k − ; compare Figure 1 for the paths. The steepest descent path Γ. Using Cauchy’s integral theorem, the integration path l can be deformed to the steepest descent path Γ. Recalling that the argument θ may range over ( 0 , π ) and that the integrand in (3.1) has a simple pole at k = 1 , we divide our discussion into three cases, namely (i) 0 < θ < π / 2 , (ii) θ = π / 2 , and (iii) π 2 < θ < π . We deform the paths case by case. I ( β ) = D 2 π i ∫ Γ e i β [ k ( z + A ) − 1 k ( z + A ) ¯ ] k 2 + 1 k ( k 2 − 1 ) d k .
where the integration path Γ ˜ consists of two segments [ 0 , 1 − ε ] and [ 1 + ε , ∞ ) and a upper half circle joining them, as illustrated in Figure 1. The last equality is obtained by using the symmetry of the integral under the transformation k ↔ 1 / k , picking up half of the residue of the integrand at k = 1 , and taking the limit as ε → 0 . I ( β ) = D 2 e − 2 y β + D 2 π i ∫ Γ e i β [ k ( z + A ) − 1 k ( z + A ) ¯ ] k 2 + 1 k ( k 2 − 1 ) d k .
z − a = r 1 e i θ 1 , z − b = r 2 e i θ 2 . Obviously we have 0 < θ 1 < θ 2 < π . We divide the half z-plane Ω into three regions, namely, I, II, and III, defined by Re z ∈ ( − ∞ , a ) , Re z ∈ ( a , b ) and Re z ∈ ( b , ∞ ) , respectively; cf. Figure 2. Then it is clear that when z ∈ III , θ j ∈ ( 0 , π / 2 ) for j = 1 , 2 ; for z ∈ II , θ 2 ∈ ( π / 2 , π ) and θ 1 ∈ ( 0 , π / 2 ) ; and for z ∈ I , θ 1 , θ 2 ∈ ( π / 2 , π ) . On the boundaries, when Re z = b , θ 2 = π / 2 , while θ 1 = π / 2 as Re z = a . The regions I, II, and III in the complex half z -plane. k 1 = i e − i θ [ 1 + τ 2 r − ( 1 + τ 2 r ) 2 − 1 ] , k 2 = i e − i θ [ 1 + τ 2 r + ( 1 + τ 2 r ) 2 − 1 ] . 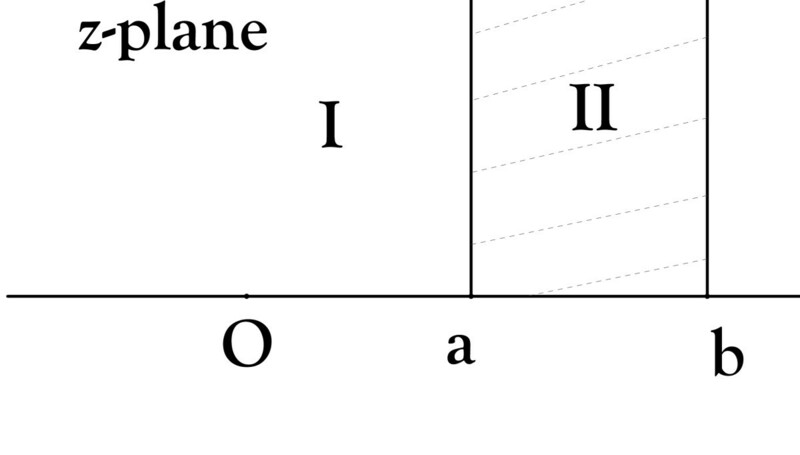 where Γ ( t ) is the usual Gamma function. We summarize our discussion as follows. as β → + ∞ and Re z = b . This research was supported in part by the National Natural Science Foundation of China under grant numbers 10871212.